Within weeks, Peter Madsen and Kristian von Bengtson will launch the first standing-room-only spacecraft. Their rocket is a cylindrical capsule that snugly fits around a standing person, with a clear plexiglass dome so that the astronaut can see out. 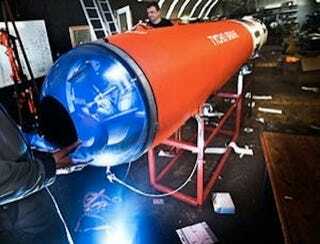 For this first test flight, Madsen and von Bengtson – founders of the non-profit organisation Copenhagen Suborbitals in Denmark – will put a dummy in the crew compartment and hope to send it 20 kilometres above Earth's surface. Their aim, however, is to use the craft to lift people to heights of 120 kilometres, making it the first Danish rocket to get to space – and the smallest crewed spacecraft ever launched. Rocket hobbyists have raised doubts about whether the minimalist rocket will remain upright on its way up, but by anyone's standards, it's a daring mission. New Scientist asked Madsen, who has volunteered to be the first passenger, why he wants to embark on such a journey. Why build a human cannonball instead of a more conventional rocket? Traditionally, astronauts are launched into space lying on their backs. This means that you have high g-tolerance [can withstand large accelerations], but it's very expensive because it needs a relatively large rocket booster. What we've done, which is very controversial, is to say, "Let's put this man standing." This gives us a lot of benefits. The rocket becomes a lot smaller – it's only 65 centimetres in diameter – and therefore lighter. Second, it gives the astronaut the visual experience of leaving Earth and travelling up through the atmosphere. This has never happened in the history of space flight. But how does the standing astronaut survive? We can choose to design our rocket engines to expose the standing astronaut only to limited g-loads, on the order of 3 to 4 g [three to four times the effect of Earth's gravity] – and only during the first 20 seconds of the flight. That's less than you expose yourself to in a rollercoaster. We have already used a "human centrifuge" here in Copenhagen to expose people to 5.5 to 6.5 gs. It was crystal clear that this type of g load, at this level and for this period of time, is relatively uncritical to our astronaut. Will this be the smallest spacecraft ever to carry an astronaut? You should consider our spacecraft as something totally different. The vessel should be considered like clothes, and the nose-cone a helmet that protects you from the vacuum of space. It's a very different kind of space flight; the person is submerged in the cosmos. How are you reducing the risk of riding in such a minimal spacecraft? This is actually a very cautious strategy in developing spacecraft. If you look back to the 1980s, the very first NASA shuttle flight was manned. We do not put people's lives at stake in test flight; we have an unmanned vehicle that flies over and over again until we are certain that it's reasonably safe. You fix those weak spots and fly again until you reach the point that it can take the entire flight without damage. Doing it any other way would be trying to learn to drink from a fire hose. Could such a human cannonball replace conventional rockets? It is potentially safer. Personally I believe that wings belong, along with landing gear and flight instrumentation, inside the Earth's atmosphere. When you're outside the Earth's atmosphere, you should build vehicles that are designed for that environment. Wings don't belong in space. And pilots don't belong in space. That's why we built a spacecraft that could – forgive the expression – be flown by a monkey. So the astronaut has very little control? Humans can only feel so much and see so much and understand it. You have 10 minutes or 5 minutes in weightlessness, and so we have made our craft completely independent of the astronaut's activity. He's not doing anything with the spacecraft; he's not flying it in any way. He's there as an observer. We have a joystick to control the attitude of the capsule, so the astronaut could turn it around and look in a different direction when he is in space. Your collaborator called Tycho Brahe 1 an "elaborate art project". Art usually has a message – what is yours? I suppose it depends on your interpretation of what art is, but one of the things that art can do is that it can open your eyes. Hopefully this mission will give everybody watching an experience of joy, through realising that such things are possible. You can go home and build your own personal spacecraft – that's a good message.